[Final Update] – Post title changed one more (and final) time. I have updated this post one final time because I didn’t realise how quickly and more importantly how high up my post would come in a search for Noah’s name. I have spoken to Noah and he is genuinely sorry and I don’t (now) think the hotlinking was done maliciously. Lesson learned, Google places a lot more stock in what I say than I had realised. Must remember to think before I Publish, must remember to …. [UPDATE] I have changed the title of this post. Many people have responded in the comments of this post to say I was too harsh on Noah – and they are completely correct. I thought about titling the post “Reasons not to steal bandwidth” (Noah’s post is titled “Reasons not to blog”) and taking a much more humourous approach to the issue but it was Monday morning and I let my temper get in the way (red hair!). Lesson learned – take a deep breath before hitting Publish! If you link to an image on someone else’s site you really should ask their permission. Otherwise, every time someone views the image on your site, you are stealing bandwidth from the site hosting the image. Noah Kagan did this recently. He used an image from this site on his blog without asking my permission. This is theft. I pay for the bandwidth that he and his site’s viewers are consuming. Of course, there is another very good reason not to link to images on someone else’s site – you have no control over those images. They could be deleted, renamed, or changed at any time – like below – I replaced the image Noah was using with a more appropriate one – now Noah’s site is hosting an image which tells it as it is! Poetic justice. That bandwidth I am happy to pay for. Hehe. nice catch. Someone on myspace is using a url on my photoblog as her background; unfortunately the url is a page, not an image. I don’t know what possessed her to copy it into her template. You should use a mod rewrite rule to stop hotlinking, I’ve had to do it on my blogs, although it doesn’t stop people using my images, a quick comment on the offending blogs usually sorts things out! I am sorry about using your image without permission and consuming your bandwidth. I removed it. I think before giving me the scarlett letter, a simple email would have worked. This is a bit way over the top isn’t it?! Did you send him and email asking him to remove it? Did he ignore your request? How much bandwidth did it actually cost you? Did *you* have the correct rights to reproduce the image in the first place? Yes linking in is annoying and bad etiquette but it hardly warrants such a defamatory response. Donncha – I have written a couple of posts on mod_rewriting to block bandwidth theft in the past – but I haven’t been as diligent about it recently as I’m pulling most of my images from my Flickr account. Noah – yes, I could have sent an email but frankly, for someone who has been blogging for almost two years, this is pretty basic stuff and as you appear to be doing it wholesale, I decided the open route would be the more effective. Joe – The response was, I believe, more inflammatory than defamatory – and purposefully so. I did not receive any emails and removed the picture immediately when I saw this post. Under creative commons license which Tom’s site has I am able to use the photo in a non-commercial way. I don’t think calling me a thief to the internet/blogging world is necessarily the best approach. As I said before a simple email would have said us both the trouble. The CC licence doesn’t give you a licence to use someone else’s bandwidth though Noel, so that excuse doesn’t really cut it. You were wrong, you’d be better off leaving it at that. Bit OTT though Tom. You have a tendency to shoot first and ask questions later, a trait I enjoy myself, but find odd in other people. I am the consumate hypocrite though. How much was the bandwidth I consumed? I would be more than willing to pay for it if that will make you happy. Am I still a thief even though when I realized I did something wrong I removed the photo? Can you please change the title? That’s it for this one. Have a cheery day Tom. Noah – you stole from me, that makes you a thief. You only satisfied one of those three criteria. Even if you satisfied all three – that still wouldn’t have entitled you to steal my bandwidth. Is that not contradictory? I do let people take any of my content, I did’t use it for commercial means and I would be glad to give you link attribution. I am missing the part where I am not satisfying all 3. I missed #4 about paying for your bandwidth if I use your images. I have been very understanding and I believe respectful about this misunderstanding. I am a tad disappointed you have not done the same. Sometimes I do the same. I usually insert a link to the source, just to tell them “thank you” for the courtesy. I’ve never received any complaint. It happens, sometimes. But I think that a private email to him would have been better. With this post, how much bandwidth have you consumed ? Moreover, I’d say that your post’s title is really too strong. what about all the other images on your site? Are you going to take down all the hotlinked images and reimburse all the site owners? You now know this practice is wrong and you haven’t removed any other images. If anybody had any images I would be more than glad to do it. I will start paying more attention to this. Please change the title of this article. I don’t think you would appreciate a Google search which attached a negative connotation to your name. I think I have been more than willing to compromise in this situation. You don’t have a Creative Commons license on your site so you were not distributing the image under the same license I was (sharealike) and you gave no attribution. I don’t think you did it for commercial reasons hence I said you only satisfied one of the three conditions. I think you’re being a bit silly now. He’s sorry. Change the title. I have no idea of the legality of reproducing and editing the said cartoon, so if the owner/creator contacts me Iâ€™ll take em off straight away! and I gave full attribution to the author of the work down to the date of the publication and I didn’t hotlink it (thereby stealing their bandwidth). it@cork require that the membership logo be taken from their site – for stats purposes I assume. Noah may be sorry but he’s sorry that he was caught, not for doing wrong. If he was sorry for stealing the bandwidth, he’s take all the other hotlinked images off his site and stop stealing their bandwidth too. Over the top tbh Tom. While I in no way condone any bandwidth theft a simple email to Noah could have solved the problem, instead you immediately took the problem to a public forum. Tom, you should really use .htaccess hotlink protection on your images. I have mine set to allow only my domains and a few online news aggregators. Noah, you’re clearly in the wrong here. Even if you are willing to make amends now, it doesn’t excuse the fact that you sinned against this man. You got caught red handed, and called out for it. You got spanked in front of everyone and now your face is red. Apologise, thank him, and move on. It may be harsh, but hey – I don’t know who either of you are. Honestly, it doesn’t matter. It’s kind of funny, kind of harsh. He used some good rewriting to out you and posted about it. I’d be more interested in seeing the technique posted here (as it has been in other places) than seeing you biting at his heels. Noah, you’re welcome to link to any of my pics. 🙂 God knows why you would though. jeez. i was drawn in by the title but ended up feeling sorry for the guy. This is way OTT Tom. Who are you to lecture on what anyone else steals from elsewhere? Worry about the 1 image taken from you, and it’s been removed asap, with an apology. Let him worry over removing other people’s site assets, you are not his keeper. You’ve been blogging long enough to know better, should have more concern for the reputation you’ve established to not act as you did, frankly very childish for a professional, and are doing no favours to rectify the common perception of Munster men being tight arses! I guess controversy is one sure way to generate hits eh! Anthony – this isn’t the first time I have used the blog instead of email and it won’t be the last. It is my preferred tool of communication. Adam – tbh I didn’t use any rewriting tool (although I have posted how to do this several times in the past). I simply renamed the image Noah linked to and put up a new image with the same name as the one he linked to. Haydn – I know what you mean. I feel sorry for him too. I note he is still stealing bandwidth from many other sites – some people are obviously slow learners. Tom I am disappointed in the way that you have reacted. Why stop with Noah, maybe you could give google a shout and ask them to stop crawling your site, and then ask people to stop reading your posts. In fact if you stopped posting altogether youâ€™d save a lot of bandwidth. Tom I’m very disappointed at how you’ve reacted to this almost with a level of sensationalism on par with tabloid newspapers. As many have said before, a simple email would have rectified the problem. You have quite a large readership at this stage Tom and with that comes a certain level of responsibility. This was very petty and immature and I’m sure it has lost you a lot of respect. TOM RAFTERY IS A DRAMA QUEEN!!!! Come on man get a grip, how much bandwidth exactly did he take & what was the incurred cost, spit out the dummy and get on with your own agenda instead of crying over spilt bandwidth. To echo some of the recent commenters on this site, I’m disappointed in your reaction Tom. It’s cheap and petty. This could backfire on you as much as the Web2.0 crap backfired on a O’Reilly. Ken – I am genuinely sorry to hear that. John – in fairness, I invited Google to crawl my site and I post for people who read my site. I see no reason why I should be subsidising Noah’s costs. John (Butler) – John, rightly or wrongly blogging is my preferred method of communication in situations like this. I think had I taken a different approach to my blog post, (more humourous, less bad tempered) people might have been less outraged. Aidan – Fair point, thanks. What Noah did isn’t good practice, he was in the wrong. I understand that blogging is your preferred method of communication but you have done yourself no favours in making this post, such a head on attack over what can surely be a tiny bit of bandwidth is unwarranted and over the top, do you not think you may have over-reacted? Even just a little bit? John – I do think so and thanks for your comments on this. If you check the top of this post you will see I have changed the title of the post and added an update to the post reflecting this. I’m just a bit confused over what he actually did wrong…was it that he used an image and didn’t link to it, just put it up like it was his own image? Cos say if I was blogging about, for example, a man in a hat..I’d go to Google Images and find a pic of a man in a hat to illustrate my post. Then I’d include a link as to where I got the pic…is that wrong? I thought once you said where you got the pic and said that it was borrowed or ‘courtesy of’ that this would be ok, particularly if it wasn’t for commercial gain, just to illustrate your post. Gosh I didn’t realise it might be wrong to do that. Is it? I don’t understand anything about bandwith either, I’m really really not good at this technical stuff! Arse, I hope I haven’t been doing anything illegal. I thought calling Noah a thief was a bit OTT to be honest, but like I said I’m ignorant of all things computer-y, so maybe it was stealing. I agree with some of the other commenters- this is way over the top. Maybe it’s the kind of treatment you’d give to a persistent infringer who failed to respond to your emails, but as a first shot across the bows it’s hugely disportionate. From his comments, this Noah guy seems contrite and reasonable, and I think he has a genuine concern about a prospective employer googling his name and coming up with this post- particularly if said employer isn’t all that net literate and doesn’t realise how commonplace this is. Not sure the change of title helps matters much- granted there’s a small difference between calling someone a “thief” and a “stealer”, but this still sounds like a non-retraction retraction to me. How about using your “How not to steal bandwidth” title? If you’re going to raise an issue about netiquette, you’re not in a very strong position with this cartoon. You stated in your post “I have no idea of the legality of reproducing and editing the said cartoon, so if the owner/creator contacts me Iâ€™ll take em off straight away!” but surely the onus is on you to find out, and it shouldn’t have taken you too long. Like all new New Yorker cartoons, licencing rights are held by the New Yorker’s cartoon division, http://www.cartoonbank.com. Their website states that “Images that appeared in The New Yorker cannot be altered in any way. All our images, including those presented on this site, are copyright protected and cannot be used in any way without permission from The Cartoon Bank, a New Yorker Company.” I can’t imagine them charging for use on a personal blog, but if you were licensing this image for commercial use on a not-for profit website for a month, it would cost $200 if your hits were under 25k a month, $240 if over. Let me just say as well that I generally really like your site, and I’m sorry that my first comment is such a flamer, but this post just got me hot under the collar. Incidentally, you can get that cartoon on a greeting card now too- I’ve one up on my mantlepiece right now. I’m afraid I’m with the majority here Tom and particularly with Ben’s comment. I remember when you did the original post with the cartoon and my first thought was that it was another good un from the New Yorker. I’ve posted Dilbert cartoons on my blog before and I’ve stated that I am probably committing copyright infringement, just as you are with the original post. Hmmm, relegated from a someone who thieves to someone who steals. Ben & Conor – I didn’t really raise an issue of netiquette – Noah did when he said he had every right to use stuff from my site as it was Creative Commons licenced. In my original post I never mentioned that and I was annoyed with him for stealing my bandwidth. Conor – if you remember that posting of that cartoon, you will also remember that it was a particularly well blogged cartoon at the time, making it onto Techmeme and being re-blogged all over. I was one of the few who linked directly back to the source (attribution) and said I would happily take it down, if asked. John – the title was changed from Noah is a thief to he is a bandwidth stealer – there is a significant difference there, I think. Plus there is an explanatory update at the top of the posting so that will be the first thing anyone reads if they come across the article now. It’s irrelevant if if was well blogged or you gave attribution, you don’t make the copyright laws. You infringed the copyright of the New Yorker, had no right to show that cartoon and quite possibly owe them fees based on the number of page views you received. Some might characterize it as “copyright theft” or “copyright stealing”. In this particular case I think we are dealing with some glass houses. And I’ll be honest, I think I may be guilty of the same thing as Noah once or twice in the past. I’d better go check those links to make sure I don’t get flamed too. Perhaps over the top but it can be a serious issue for some sites. Until I started using hotlink protection people stealing my images for their sites were costing me 100s of megabytes of bandwidth each month. Just to let you know when clicking on ‘Tom Raftery’ (two posts up) brings to http://www.tomandpilar.net site which generates 8 virus alerts. All are trojan types. I’ve never came across a website that provoked so many virus alerts – my virus log (within virtual machine) logged first time for two years! You would want to check it out fast. Wow Conor – no idea how that happened – that is an old mothballed site – I have now taken it down and updated the link. Tom – get a grip. nuff said. I’m not going to get into who is wrong and who is right as I think that has been discussed to death already. 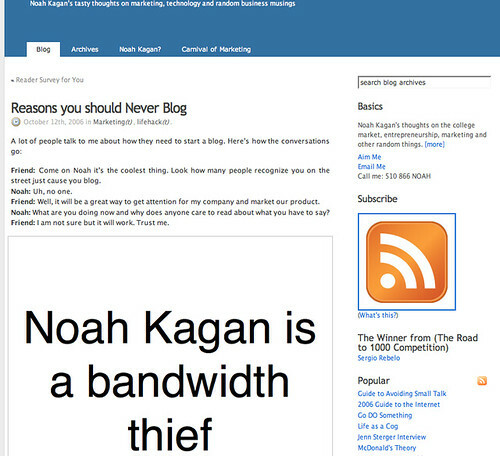 Just wanted to say that it might be an idea to update the permalink name from “noah-kagan-is-a-thief”, as well as the title. I am just now leaning about hotlinking images and I don’t want my images hotlinked so I went through my own blog and began to undo all the hotlinking I had done. I know that many people simply “copy the image location” because they may not know any better, I didn’t. This was a new concept for me so I am sure others out there are unaware of how bad hotlinking is. 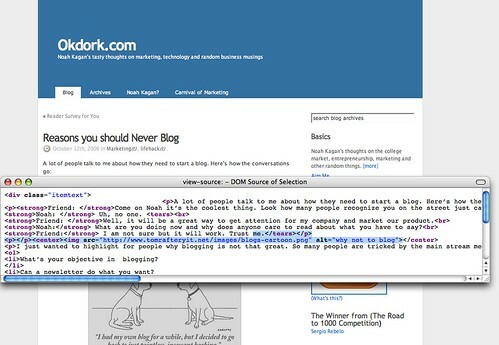 The more talk of hotlinking the more people will know and understand what they are doing. My question is how does one find that their images is being hotlinked?? Talina, the best way to find this out is to keep an eye on your site stats – if you see a lot of traffic coming from a site or an image being downloaded a lot, then you start to get suspicious. 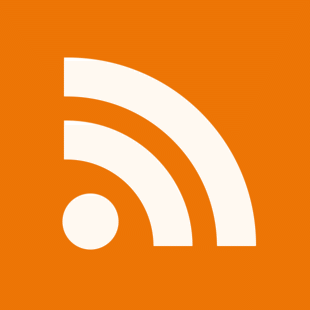 In this case, I have an RSS search for my domain name and this found the hotlinked image.